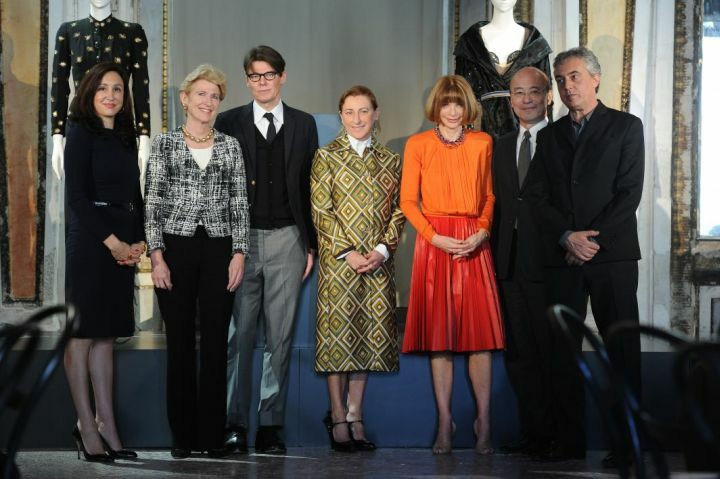 The Metropolitan Museum of Art hosted a press presentation today at the Palazzo Reale in Milan to reveal early details about its upcoming exhibition, Schiaparelli and Prada: Impossible Conversations. Stefano Boeri, Miuccia Prada, and Anna Wintour joined Museum President Emily Rafferty and Curators Andrew Bolton and Harold Koda for a glimpse of some of the Schiaparelli and Prada objects which will be featured in the exhibition, on view from May 10 – August 19, 2012, at the Metropolitan Museum in New York City. "Waist Up/Waist Down" will look at Schiaparelli's use of decorative detailing as a response to restaurant dressing in the heyday of 1930s café society, while showing Prada's below-the-waist focus as a symbolic expression of modernity and femininity. An accessories subsection of this gallery called "Neck Up/Knees Down" will showcase Schiaparelli's hats and Prada's footwear. "Ugly Chic" will reveal how both women subvert ideals of beauty and glamour by playing with good and bad taste through color, prints, and textiles. "Hard Chic" will explore the influence of uniforms and menswear to promote a minimal aesthetic that is intended to both deny and enhance femininity. "Naïf Chic" will focus on Schiaparelli and Prada's adoption of a girlish sensibility to subvert expectations of age-appropriate dressing. "The Classical Body," which also incorporates "The Pagan Body," explores the designers' engagement with antiquity through the gaze of the late eighteenth and early nineteenth centuries. "The Exotic Body" will explore the influence of Eastern cultures through fabrics such as lamé, and silhouettes such as saris and sarongs. "The Surreal Body" in the final gallery will illustrate how both women affect contemporary images of the female body through Surrealistic practices such as displacement, playing with scale, and blurring the boundaries between reality and illusion as well as the natural and the artificial.